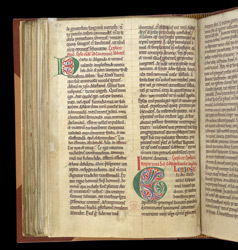 Although there is no explicit evidence that this manuscript came from the Augustinian abbey of the Holy Trinity, Kirkham (Yorkshire), it once formed part of another manuscript which bears the Kirkham ex-libris. This page contains the end of the prologue, a letter from Ailred to abbot Laurence with a decorated initial 'D', and the start of the Life of St. Edward itself, with an initial 'G'. Their size and degree of elaboration reflect the relative importance of each text.